Lucky I didn't have Jay drop him from the team. Translation: "I was hooking up with Kim Kardashian while she was hooking up with Kris Humphries, but she preferred him to me, which is insane, but whatever. I remained calm and did not ask my friend Jay-Z to eliminate Kris from the New Jersey Nets — as you may know, he is a minority owner of the team. I could have, but I didn't. Kris — and you — should consider yourselves lucky. Good day. I SAID GOOD DAY." Kanye also namedrops Anna Wintour, Project Runway, model Anja Rubik, and $6,000 shoes. In addition, he says he has respect for Wiz Khalifa, who is engaged to his ex, Amber Rose. Tell PETA my mink is dragging on the floor. 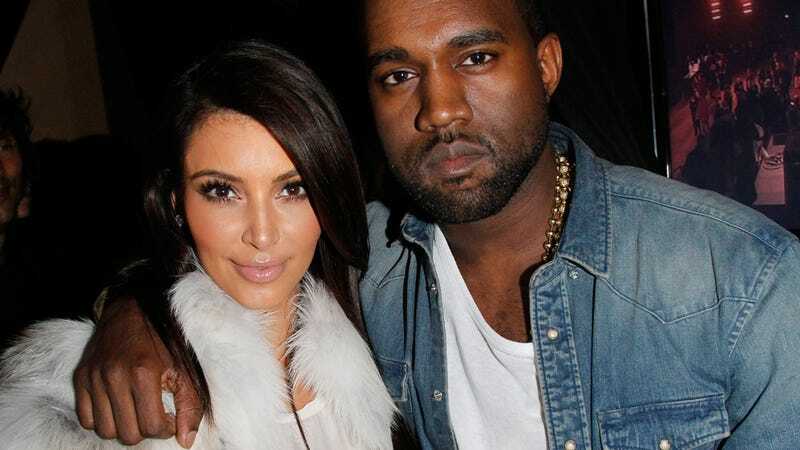 Kimye just went on a date. They went to see a light-hearted romantic comedy called The Hunger Games.